As you type your code it is automatically checked for syntax errors. 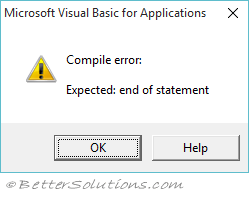 If any syntax errors are found then you are alerted with a pop up message box. For example any misspelled keywords or missing separators will be identified. When this option is switched On. Typing Public Sob Test and pressing Enter will display a pop up dialog box. 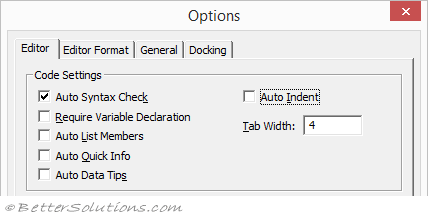 Also changing a valid line to an invalid line will also display a pop up dialog box. At some point you may start to find these pop ups frustrating in which case it is time to turn this option off. Don't worry though your syntax errors will still be identified in a different colour, so they are easy to spot.